Over the past couple of decades, vampire cinema has dedicated a lot of energy to breaking away from stereotypes, warding off the garlic and crucifixes while telling innovative stories about immortal beings who, y'know, so happen to have to drink blood on a regular basis. Often, this results in the filmmakers focusing on the more introspective and existential aspects of living such long-lasting yet morbid lives, delving into the conflicts involved with feeding, maintaining their longevity, and existing among humans. With that, they always risk rubbing horror fans the wrong way, dodging claims that vampires who aren't bloodthirsty monsters can't be "real vampires" and so on. German import Therapy for a Vampire attempts to channel both classic interpretations and modernistic reflections on vampirism into its own jovial project, but mixing the two results in a stiff, directionless portrait of underwhelming characters circling themes of mortality and identity. 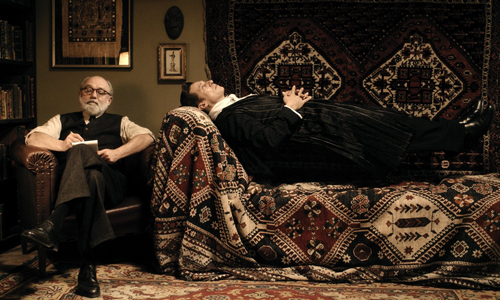 Set in Vienna during the 1930s, Therapy for a Vampire starts out in the office of Dr. Sigmund Freud (Karl Fischer), who has recently taken on a new, nighttime-bound client: Count Geza von Kozsnom (Tobias Moretti). As someone who navigates dreams and identity crises on a regular basis, the hints that the count offers to his true nature -- being a vampire -- don't unsettle the psychoanalyst. Geza sought out this therapy due to his growing frustration with his immortality, his weakening relationship with his beautiful yet sharp wife, Elsa (Jeanette Hain), and his absorption with memories of "the one who got away". These feelings are stoked when he spots a striking, wavy-haired blonde woman in a painting who looks exactly like his lost love, done by one of Freud's associates, local artist Viktor (Dominic Oley). Geza sets out to find this woman, Lucy (Cornelia Ivancan), in hopes of resurrecting that feeling; Elsa, in turn, years to see herself again, something she can't do in a mirror yet something she might could do through an artist's rendering. Enough positive things can't be said about the physical atmosphere within Therapy for a Vampire, which shapes the cobblestone streets, iron gates, and smooth walls of the European architecture into a gorgeously hazy, shadowy gothic playground for its off-center characters. Writer/director David Ruhm's direction evokes an attitude reminiscent of a cross between Jean-Pierre Jeunet's whimsy and Woody Allen's quirkiness, landing on a mildly absurdist depiction of vampires caught in the doldrums of immortality and humans striving to grow more comfortable with themselves. What it lacks, however, is the endearing charms of Delicatessen or the existential and nostalgic playfulness roaming the streets in Midnight in Paris, never sinking its teeth into the kind of sardonic morbidity or underlying substance that would give necessary flavor to its dramatic musings. That's because Therapy for a Vampire can't settle into exactly what it wants to be, landing in a safe but nondescript zone between dry comedy, vintage -- almost silent-era caliber -- shenanigans, and uncommitted pensiveness. The most notable stabs it takes at getting laughs happen very early on, during an introductory session with Dr. Freud where Count Geza unleashes a lengthy stream of vampire puns in describing his ailments, ever nudging and winking at the audience's awareness. While cheeky and mildly amusing, it's also quite on-the-nose, almost like a bunch of "dad jokes" delivered in deadpan fashion by the straight-faced Tobias Moretti. That sets the tone for the musty, droll sense of humor that hangs in the air throughout the film, feeding directly off of old-hat vampire tropes -- hypnotism, memory wiping, mirror reflections -- while playfully building up and derailing relationships through the immortal being's schemes. These fantastical elements that keep Therapy for a Vampire going might've been acceptable, even enjoyable, had they contained more of a purpose, had they crafted a vehicle for something more reflective or, on the other side of the spectrum, arrived at a more unsettling destination. Instead, alongside a few touches of bloodshed that generate zero suspense or horrific impact, the film filters a premise similar to the relationship existentialism of Only Lovers Left Alive through the recognizable conventions of a Dracula monster movie, straining out any contemplative material about modern society in the process. Like this, the silliness of painting blindfolded, blood transfusions as a cure for vampirism, and their obsession with, uh, counting things needs more justification than following the antics of mopey vampires, controlling husbands, and women pursuing their lost identities. Perhaps Therapy for a Vampire needs a few sessions of its own to work out its identity crisis.